How to use option "Triplicate price"
Use this function if you have an allotment on any OTA but you don't want to leave the room unsold! From section ROOMS, click Edit to access room settings. In the next window, look for section RATE OPTIONS and activate "Triplicate price". 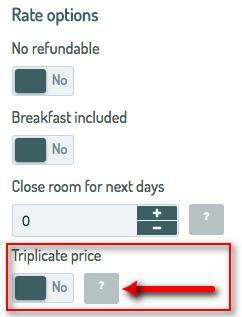 By activating this option, Octorate will triplicate the room price as soon as the availability goes down to 0 (zero). This feature is very useful to avoid overbookings if you manage OTAs that need allotment. Warning: if you receive a cancellation you must re-open availability and set prices manually.